Applications are invited from unmarried/ married male and unmarried female or widow of defense candidates for for grant of Short Service Commission (SSC) in the Indian Army. (i) Educational Qualification : Degree of a recognised University or equivalent with aggregate of minimum 50% marks taking into account marks of all years. (iii) Grading : Should have minimum of 'B' Grade in 'C' Certificate Exam of NCC. Wards of Battle Casualties : Holding of NCC 'C' Certificate at the time of filling of applications not required. Wards of Battle Casualties send their applications direct to Addl. Dte. Gen of Recruiting, Recruiting NCC Entry, West Block-III, R.K. Puram, New Delhi-110066. A letter to the effect that the parent has been killed/ wounded/ reported missing in action issued by MP/Dte/ Respective Regimental Records and a copy of Part II Order notifying injuries and being classified as Battle Casualties in case of Service/Medically boarded out pers. Last date for receipt of application at Rtg Dte 22/08/2016 for this category. Pay Scale & Stipend : Stipend during the period of training is Rs.21000/-. On completion they will be commissioned as Lt in the pay scale of Rs.15600-39100 with Grade Pay Rs. 5400 and MSP Rs. 6000/- and other allowances. 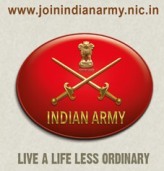 How to Apply: Apply Online at Indian Army website http://www.joinindianarmy.nic.in only from 21/07/2016 to 18/08/2016.